Please note that the content of this book primarily consists of articles available from Wikipedia or other free sources online. 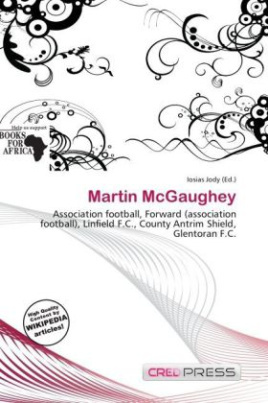 Martin McGaughey (born 31 August 1960 in Moneyreagh) is a retired Northern Irish footballer who played as a striker. Having spent most of his career at Linfield, he was noted for his scoring ability, being nicknamed 'Buckets'. Having signed as a youth with Linfield F.C. in 1977, McGaughey made his first team debuts midway through 1980 81, finishing his debut season with 14 goals in all competitions, including a brace in the County Antrim Shield final against Glentoran FC (4 1). In 1984 85, he finished second in the European Golden Shoe race, to F.C. Porto's Fernando Gomes, scoring 34 league goals in 26 matches (56 overall), and failing to add more as his season was cut short due to a severe knee injury.